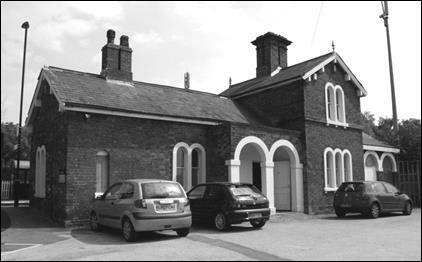 The building is Grade 2 listed but after two failed restaurant ventures it was abandoned and was becoming dilapidated putting the viability of the Station itself at risk. The owner’s sale at auction received no bids. Our plan was to have it used again, in any function, and as Heritage lottery funds were available we applied to turn it into a Heritage Centre. We were successful in our first stage application but after more years of work it was turned down. As we had become associated with the building we received several approaches from potential buyers or tenants which we passed on to the owner. As he does not live locally he asked us to hold the keys and act for him in showing potential users the building which we did many times. We are very pleased that this important local building has now been completely refurbished (after years of increasing dilapidation) and a new micro pub business has opened there. Having spent many years endeavouring to rescue this building, the Civic Society were able to provide advice and guidance to the new tenants, which enabled them to make swift progress towards achieving their objectives - resulting in the opening of the Platform Ale House on 29th July. We wish Alison & Craig Taylor and Emma & Paul Thompson all the very best for a successful business venture and we encourage readers to visit & sample the excellent ales and other drinks & snacks on offer there. The fifth Planter has now been positioned at the corner of the Co-operative Shop and we have provided a watering can and the shop manager has kindly agreed to keep it watered. Many thanks to all who visited out stall on Fayre Day and joined or renewed membership of the Society. As well as building up funds it is important that we increase our membership which shows local support and provides us with credibility when dealing with the authorities. A big thank you to committee member John Bulmer who donated dozens of expertly grown plants which we sold at the stall to boost Society funds. We also had gardening experts on hand to provide advice which seemed to go down well. We will hold a Public Meeting and AGM at 7pm on Monday 10th October 2016. We are now organising speakers/topics which we hope will be of interest to residents.